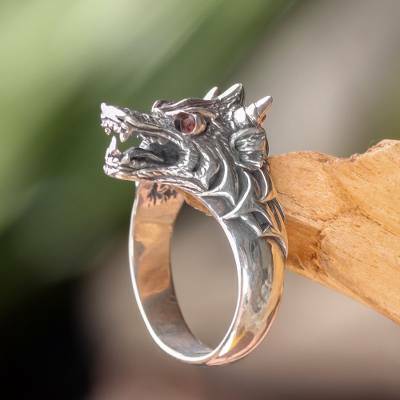 Garnet and Sterling Silver Men's Dragon Wolf Ring, "Dragon Wolf"
Glowing garnet eyes add to the fearsome appearance of a mythical creature summoned by artisan Henry Anthony Sanny's imagination. The Balinese artisan crafts a men's ring in sterling silver, featuring a snarling creature that is half wolf and half dragon. The word "Strength" is engraved on the underside of the crown.